Robert F. Kennedy Jr.: Follow-up on his anti-vaccination claims. Robert F. Kennedy. Jr., at the Natural Resources Defense Council’s 20th Anniversary Celebration in April 2009. 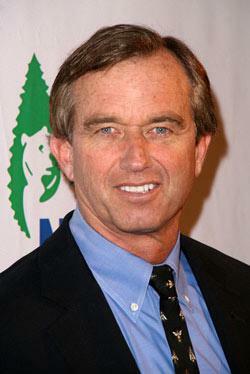 Last week, I wrote an article strongly condemning Robert F. Kennedy Jr.’s stance on vaccines. In a nutshell, he believes in an elaborate and ridiculous conspiracy theory that scientists all over the world, but especially at the Centers for Disease Control and Prevention, have been lying about the safety of vaccines. He claims that thimerosal, a preservative now used only in one specific kind of flu vaccine, is destroying the brains of our children. He believes this despite a vast amount of evidence that he’s grossly wrong. Despite test after test, a link from thimerosal to autism has never been shown. But Kennedy chooses to ignore the huge number of researchers who say this and instead focuses on a cherry-picked few, including some with somewhat, ah, shaky credentials. While I’ve written about Kennedy once or twice before, the fact that he was the keynote speaker at an anti-vaccination (and generally anti-science alternative medicine) convention was what prompted me to write what I did. That, plus my editor, Laura Helmuth, asked me to. She had seen Keith Kloor’s article about Kennedy over at Discover and knew this was up my alley. I thought it was a good idea, and there you go. What happened next in this saga still has me chuckling wryly and shaking my head. Kennedy’s office declined to write and enumerate any of my supposed errors but wanted to call instead. Helmuth agreed to this and decided to take Kennedy’s call herself. What unfolded was eerily as I predicted. Kennedy ranted at her for the better part of an hour. At one point he claimed more than one scientist supports him. Interestingly, when Helmuth contacted one of these scientists, he said Kennedy “completely misrepresented” him. Another scientist she contacted said much the same thing. Shocker. I knew that would be the case. Listening to Kennedy’s radio show and reading his articles leads to an all-too-clear conclusion: When it comes to vaccines, he has all the signs of a crackpot. He ignores (or dismisses) evidence that contradicts him, he clings to cherry-picked (or quote-mined) evidence and clearly wrong evidence that supports him, he imagines vast conspiracies, he says scientists at the CDC are criminals, ad nauseum. His history is full of him saying such things. As Helmuth notes at the end of her article, Kennedy was only able to make one even marginally tenable claim about my article being wrong: He said he wasn’t anti-vax but acknowledged vaccines had saved millions of lives and was actually “pro-vaccine.” But I disagree. Saying in one breath that vaccines have done good but then in another attacking them and increasing fears of them based on nonsense puts him squarely in the anti-vax camp. It’s like saying that most UFO cases are just misidentified normal things, but the ones we haven’t identified are definitely alien spaceships that come here to stick probes in our various orifices. Acknowledging one aspect of reality and then claiming absurdities does not make you pro-science. People are getting sick, and some are dying due to preventable diseases. It’s awful, and the only way to stop it is to get the real information out to people and speak out against those who misinform them. Correction, June 13, 2013 at 18:15 UTC: The California pertussis epidemic in 2010 was originally stated as occurring in 2013. My apologies for this oversight. A synopsis of the epidemic is available at the NCBI website, and pertussis is still a scourge around the world today.